For three days earlier this month, officials in Ohio warned a half-million residents not to drink their tap water. The reason? Water samples had tested positive for a toxin due to the massive blue-green algae bloom that hovered over Toledo's public drinking-water-intake pipe in Lake Erie. The proliferation of blue-green algae, also known as cyanobacteria, is a problem in lakes across the country, including Lake Champlain. Fueled by excess phosphorous in the water from farms, fertilizers and road runoff, algae blooms appear perennially in Lake Champlain in late summer and early fall. The lake supplies drinking water to more than 200,000 people, an estimated 140,000 of whom live in Vermont. After "high alerts" trickled in this month for blue-green algae in the St. Albans and Missisquoi bays, Vermonters wondered: Could the same toxins that took Toledo's water off-line imperil Lake Champlain's drinking water? In a sense, they already have. Though drinking water from Lake Champlain on this side of the border has never tested positive for the toxins associated with blue-green algae, some Québec residents routinely receive notices that their water is not safe to drink. 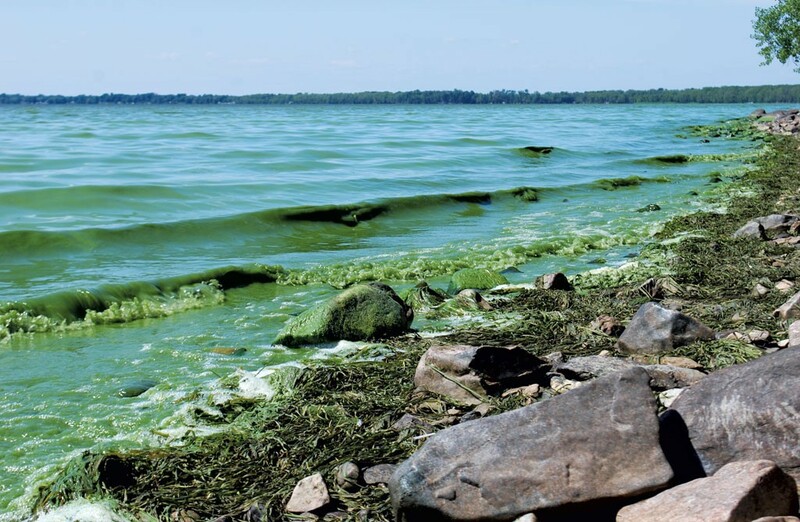 According to one study tracking public health advisories in the region between 2001 and 2009, concentrations of one of the toxins produced by blue-green algae regularly exceeded the Canadian drinking water guidelines. "I've lived in Bedford since 2004, and it happens every summer," said Aleksandra Drizo, a research fellow at the University of Vermont and the CEO of PhosphorEduc, a company that creates and markets technology for removing phosphorous from water. On a recent afternoon in Philipsburg — a sleepy little village in Québec located just minutes from the U.S.-Canadian border — green, soupy water lapped at the shores of the Missisquoi Bay. At the village quay, cyclists paused to take in the view. A teenage boy and girl at the end of the pier fished from a picnic table. A stone's throw away, a low thrum was audible from the treatment plant, which pulls water from the bay and pipes it into Philipsburg and Bedford. Every year, Drizo said, she receives a flyer from the town warning against drinking the tap water. Instead, residents can bring their own jars and containers to a large cistern provided by the town. The warnings are followed by a second set of flyers advertising, in French and English, "L'eau est bonne pour la consommation humaine," and "Water can be consumed by the citizens." Drizo opts to buy most of her drinking water. Blue-green algae release toxins when cells die or are disturbed. The toxins can cause gastrointestinal and respiratory illnesses, as well as headaches and muscle pain. Researchers are also investigating the possibility that some of these toxins might be connected to long-term health effects and neurodegenerative diseases such as ALS. In both Canada and Vermont, officials warn against any contact with green, scummy water. Skin contact can cause rashes and stomach illnesses, and aerosolized water droplets that contain algae can produce allergy-like symptoms. Pet owners are warned to keep animals out of blooms; two dogs died in 1999 and 2000 after coming into contact with Lake Champlain's algae-polluted water in Point au Roche, N.Y., and on Juniper Island, southwest of Burlington. Currently, public water systems in the United States aren't required to test regularly for microcystin or anatoxin — toxins released by the algae. But in Vermont, Department of Environmental Conservation Commissioner David Mears assures voluntary measures are in place, and all of the state's public water systems follow them. If operators learn about a bloom near an intake pipe, they collect water samples and send them to the state lab in Burlington for analysis. In light of the contamination in Toledo, Mears said, DEC scientists and drinking-water-system operators plan to meet and reevaluate the current testing protocol. James Ehlers, the executive director of the advocacy group Lake Champlain International, warned that Vermont faces exactly the same problems that fueled the Ohio emergency. "This is our water. This is our home," said Ehlers. When Vermonters contribute to pollution in the lake, he said, "we're fouling our own nest." Last week, the nonprofit Lake Champlain Committee, which coordinates the volunteer monitoring program that tracks blue-green algae blooms, pressed its members to urge the Environmental Protection Agency to develop standards for blue-green algae toxins; there aren't any under the Safe Drinking Water Act. LCC director Lori Fisher emailed members that the "EPA seems to be trapped in a cycle of over analysis in search of perfect standards," and that in the meantime states have resorted to a "mishmash of different approaches in the absence of EPA leadership." Mears said it makes sense for the EPA to take the lead on blue-green algae standards. He also said he understands the frustration of lake advocates who would like to see better standards on the books — now. But "It's not the kind of research that a small state like Vermont can afford to do," said Mears. At drinking-water-treatment facilities, plant operators are doing what they can for the time being: keeping an eye on the lake, and sending off samples for testing when the need arises. That means patrolling the area near the intake valve for the Champlain Water District. The pipe is located 75 feet below the surface of the lake in Shelburne Bay, 2,500 feet offshore. Champlain Water District supplies drinking water to roughly 70,000 residents in Chittenden County. "We've been on the lookout for at least 10 years, because that's our job — to pay attention," said Mike Barsotti, the facility's director of water quality and production. "We haven't seen anything in 10 years." That's not the case at the southern and northern ends of the lake, where algae blooms are more common. Mark Simon is the owner of Simon Operation Services, which oversees about 40 water-treatment facilities in Vermont — including the drinking-water-plants for Grand Isle and North Hero. In North Hero, Simon said, operators see blooms near the intake valves "almost annually," and work with state health officials to monitor for any possible toxins. "Blue-green algae is a beast of its own," said Simon. While plant operators can add chemicals or other additives to treat for other types of contaminants in the water, neither the North Hero nor Grand Isle facilities could handle cyanobacteria. "It would go right through the filter." According to the EPA, the toxins associated with blue-green algae can be tricky to detect and remove from drinking-water supplies. Some treatments work, others don't, and the situation is complicated by whether cyanobacteria cells are intact or broken. Mears said he hopes the drinking-water emergency in Toledo galvanizes more Vermonters to take seriously the challenges facing Lake Champlain. It's important to ensure best practices at water-treatment facilities, he said, but "the longer term, and the most important solution is preventing the blooms from happening in the first place." On the other hand, Mears doesn't want to scare anyone away from the tap. "The fact is, in the state of Vermont, we are very lucky," said Mears. "We have some of the highest quality drinking water you can get anywhere — better than most bottled water." Our neighbors to the north are not so fortunate. Back on the Philipsburg quay, Diane Bilodeau paused while walking her little black dog. Her first language is French, but in English she explained that she blamed the water for stomach pains and other illnesses, clutching at her stomach for emphasis. She remembered her neighbors in Bedford, where she used to live, expressing horror upon learning Bilodeau had been drinking the tap water; one gave her several bottles of distilled spring water. Inside the nearby treatment plant, a slender, bespectacled young man manned the telephones and kept an eye on a computer monitor, where a schematic showed tanks and pipes. Asked about blue-green algae, operator Philippe Rioux explained that the treatment plant had to shut down periodically because of the problem. After a pause, he said, "I'm not sure if it was last year or the year before. The water wasn't drinkable." Sometimes algae is to blame. Sometimes it's other problems, like too much manganese in the water. Three summers ago, he recalled, the water facility was down all summer long due to the algae blooms. "Today it's not too bad," he said, when asked about the algae that had turned the water green that afternoon. "I've seen it much worse than that." The original print version of this article was headlined "Green Alert: Public Water Systems Watch for Toxic Algae in Lake Champlain"